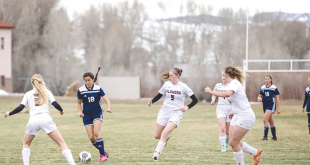 After spending another week on the road for league matches with Del Norte and Ignacio, the Crested Butte girls soccer team will host their first home games of the season this week, including a match on Thursday, April 11 when they face the Ridgway Demons behind the Gunnison middle school at 4 p.m. The trip last week opened with Del Norte on Wednesday, April 3. It was a rematch almost one year in the making as Del Norte handed the Titans a tough 3-2 loss late in the season last year. Not to mention Del Norte beat the Titans in both volleyball and basketball this year, so revenge was on the minds of the Crested Butte players. “After last year and losing to them in volleyball and basketball, we really thought we could take them in soccer,” says head coach Julia Kidd. 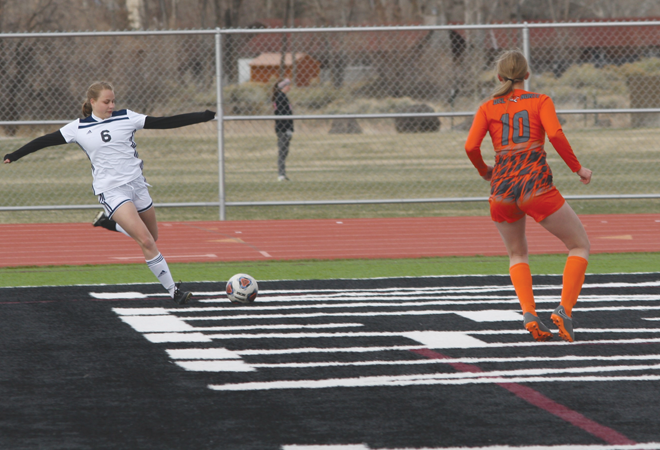 Unfortunately, while Crested Butte outmatched the Del Norte Tigers for all 80 minutes of regulation, the teams were locked in a 0-0 tie, forcing the game into overtime. The Titans’ back line and midfield did their jobs to keep Del Norte from any semblance of attack and the three or four times goalie Anika Anderson even saw the ball, she made the necessary stops, and the two teams headed into overtime. Despite continued control of both pace and possession, the Titans’ scoring struggles continued as they ended with a 0-0 draw with Del Norte. Two days later, the Titans returned to the road to face Ignacio and exorcised their scoring struggles as they jumped out to a 7-0 lead in the first half and then hit the mercy rule 10 minutes into the second half for a 10-0 win. “I had them work on two-touch soccer and forced them to make at least four passes before shooting but they just rattled off three goals early in the second half,” says Kidd. Tess Fenerty led the team with two goals, with eight other Titans also finding the back of the net. The Titans are now 6-1-1 and ranked fifth in the state in 2A. But even more exciting is the fact that they may now be able to practice on grass for the remainder of the season and are hosting their first home games of the season in Gunnison this week. The Titans will host Ridgway on Thursday, April 11 at 4 p.m. on the soccer field behind the middle school. The high school field is unavailable, since work to put in the Verizon cell tower damaged the field—and that’s no April Fool’s joke.